Friday night I returned from Boston where I was attending the Openstack Design Summit and Conference hosted by Rackspace. The Design Summit is a UDS like where developers come together and hammer out a feature in the form of a blueprint for the next release of Openstack. I think the concept is still new to a lot of people since I still saw more presentations than discussions at the sessions I attended. However people will get use to the format as time goes on. The design summit was for the first 3 days while I was in Boston. Since I work at Canonical and as a member of the Ubuntu Server Team, these days I am mostly interested in Distros/Integration (since our next release is an LTS release), Orchestration, and the EC2 API. Integration – Distros such as Ubuntu, Fedora, and RHEL (and ultimately providers such as HP and Dell) care more about having a stable release the an cutting edge release so that their users can use Openstack without having to pull their hair out. Dave Walker hosted a session about doing a Stable Release where interested parties can use a common base for distros and integrators role out releases to their users. The result of this session was that a group of interested parties will be created to take care of it. Later in the week we had a Debian packaging BOF and a Distro BOF and we got to talk about Packaging and what other people are doing with Openstack as well. Orchestration – providing a path for users to deploy Openstack easily is becoming a *BIG* thing in the Openstack ecosystem. Companies such as Dell, Nebula, and Canonical are providing tools such as Crowbar and Juju/Orchestra. They are all competing to do the same thing and all have basically the same ideas. The real question is how can they innovate a deployment and set themselves apart from one another. EC2 API – I hosted a session about the EC2 API in Openstack. Quite frankly, I was surprised how full the room was and there was a lot of good discussion moving forward. In the Diablo release, there was more focus on the Rackspace API since Rackspace is going to be deploying the Openstack for their customers so a lot of bugs didnt get fixed in time. However, there is a lot of discussion on how people still want their tools such as ElasticFox and boto to still work on Openstack. I think the consensus at the end of the session was to form a “working group” of people who are interested in fixing and maintaining the EC2 API in Nova. Juju – On the final day of the conference Jane Silber, Canonical’s CEO, gave a presentation of what we are doing with Openstack and juju. 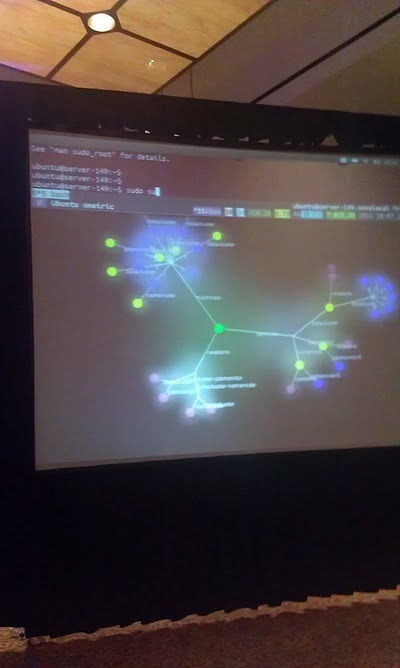 It was a pretty cool demo because the deployment of a hadoop cluster was visualized using gource as it was deployed. I think a lot of people are visual people and it was a good way to get a lot of peoples attention. After the demo, I think there was a lot of buzz around juju since people wanted to know more about it. The juju session in the afternoon on Friday was packed and the canonistack use case session was well attended because people wanted to know more. HP – At the conference HP gave a keynote on how they are using Openstack to offer a public cloud. Right now it is in beta testing for people that have been signed up and have been accepted by HP. What a lot of people didn’t know was that their cloud was running on Ubuntu Server, which was also announced in Jane’s keynote. ARM – Ever since the Corel Netwinder was released I have been an ARM fan boy and Jane announced in her keynote that Oneiric is one of the first server based distros that can run on ARM. However since this is a Openstack conference, yes in Oneiric you can run Openstack on ARM. There are ARM specific images that you can use and you can get them at the regular places. It uses LXC for virtualization. I will probably have another blog post about this later. It was a great week to be in Boston and seeing a lot of old friends in the community. However I just realized that UDS is not far down the road and I will be doing this all again soon. October 9, 2011. Uncategorized. Leave a comment.